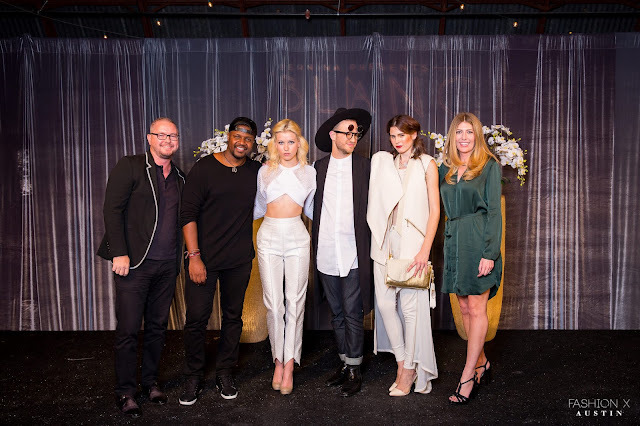 On November 6, Bernina Presented Fashion X Austin: BLANC. The event was a one-night fashion spectacle with live fashion presentations and photo shoots from stunning Texas-based designers and pop up shops hosted by over 40 top brands in the local Texas fashion scene as an early “holiday shopping” experience. Each brand offered a unique “blanc” item with a portion of proceeds benefitting the Austin Fashion Fund. 59 entrants had been curated down to 12 garments that were all inspired by the Swiss Alps (BERNINA’s home country). Dallas-based Neil Marek was named the winner of the first ever BERNINA Blanc Design Challenge and was awarded a prize package valued over $20,000. Marek is co-designer of the Marek + Richard line, known for its "funky fresh" line of mens tops, underwear and swimwear. I understand this competition was his first foray into womenswear and it's clear he is headed in a positive direction with this win. Fan Favorite was Dallas' own Venny Etienne who received a Bernina 1300 MDC serger and coverstitch valued at $2,300. Sweet. Other finalists included: Alisha Contreras, Hannah Leonard, Amanda Scarlett Smith, Dina Chavez, Kassie Carrell, Kraig Pieper, Marissa Marsh, Samantha Plasencia, and Stefanie Bell. I asked Etienne how he came up with his winning design. "I was particularly inspired by the shapes of the Swiss mountains. That is where I came up with the idea of the triangular motif through the garment. I also knew I wanted to create a piece that was strong but yet still clean. She had to look in charge and tall so I decided to create a 2-piece crop top look." Etienne has had quite a year, from winning RAW artist designer of the year, a Paris scholarship from FGI Dallas along with a serger and cash scholarship, showing his LeVenity SS16 line during Style Fashion Week in LA and now this accolade. So, what's next for this emerging Dallas designer? "I must say this has been an amazing year for me and for my brand LeVenity," muses Etienne. "We are currently starting the pre-order process for our new SS16 line for LeVenity and will be working on the next collection. Soon you will see the LeVenity line on the racks of major luxury boutique stores in major cities near you!" Click here to head over to Facebook for photos from this fashion competition. Click for more information about Fashion X Austin or Fashion X Dallas.